BOOOM! Pat Sajak DESTROYS Jimmy Kimmel With In Your Face Truth Tweet! Pat Sajak, of “Wheel of Fortune” fame, has one of the brightest wits I have ever seen. He used that razor sharp wit against Jimmy Kimmel, who suddenly fancies himself America’s conscience as branded by CNN. That’s laughable. 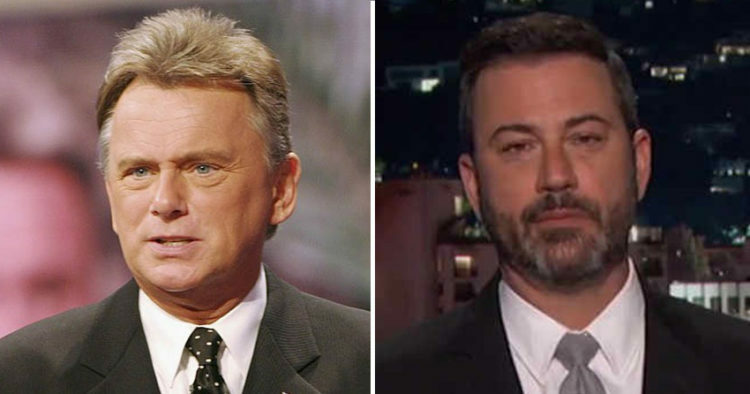 Sajak slam dunked Kimmel in one biting tweet: “OK, let me explain this again: We’re celebs. We’re wiser & more empathetic than you. We are famous. Please take our opinions more seriously.” That is epic, scalding sarcasm right there. Respect. And Kimmel certainly deserves it as he condescendingly talks down to mainstream America and conservative politicians telling them they have blood on their hands for not passing gun control. Asshat. Kimmel took to his show two nights in a row after the Mandalay Massacre to use dead Americans as a political prop to demand gun legislation. He thought that formula worked for him on Obamacare. It didn’t and this certainly won’t. This is how he blatantly stood on the bodies of the dead in Vegas to push this crap: “This morning, we have children without parents and fathers without sons, mothers without daughters. We lost two police officers. We lost a nurse from Tennessee. A special-ed teacher from a local school here in Manhattan Beach. It’s the kind of thing that makes you want to throw up or give up. It’s too much to even process — all these devastated families who now have to live with this pain forever because one person with a violent and insane voice in his head managed to stockpile a collection of high-powered rifles and use them to shoot people.” Kimmel doesn’t care about these people… he’s pushing a political agenda and the blood hasn’t even dried yet. It’s disgusting. Kimmel is an entertainer… he’s a comedian. He is not an expert in guns, gun rights or constitutional law. He’s just a guy, who just happens to be communist in his political leanings. No one should listen to this joker. This is a guy who swills beer and likes to show girls bouncing on trampolines. If he’s our new collective conscience, then we are doomed. And he’s not… he’s a pompous little man who sees himself as being far more important and influential than he is. He’s pathetic. Pat Sajak’s tweet was classic and it should highlight just how arrogant and self-important celebrities are. We don’t care what they think. They are supposed to entertain us, not politicize and divide us. I’m sick of it. All of these nitwits need to put a sock in it and shut the hell up and quit trying to take our God-given rights away. Who the hell do they think they are? Lady Gaga, Ariana Grande, Amy Schumer and a whole list of other celebrities need to get this… we’re just as upset as you. About Obamacare, skyrocketing insurance rates and tragic mass shootings. About violence in our streets, immorality in our schools and the spreading communism across our nation. About everything you stand for. Their arguments are hollow and don’t hold water. You can’t lecture and moralize when you have no morality. Facts and evidence are what convince people. And the fact is, gun control has never worked and you are only taking guns away from the good guys, not the bad guys. In a nation of over 300 million Americans, the only thing that makes celebrities stand out is their ability to pretend they are something they aren’t, lie very convincingly and entertain us with acting, singing and humor. They just aren’t that special. Get over yourselves already. We have, trust me.